The reason why this issue occurs during a ViPR storage provisioning task with VPLEX is due to the fact that ViPR incorrectly attempts to apply two simultaneous updates to the Cisco MDS IVR database, correctly the MDS database is locked by the first task and the second task times out resulting in a failed ViPR provisioning process. The tasks should be executed in a sequential fashion allowing each task to complete and then commit changes to the IVR database thus removing the lock it held once the commit is successful. Once the database lock is removed then the subsequent task may execute on the database. Executing an exclusive storage provisioning order from ViPR catalog for a single ESXi host works perfectly, including automatically creating the required Cross-Connect Zoning, this is due to the fact the single workflow performs MDS IVR database updates sequentially. During the single ESXi host exclusive storage provisioning task ViPR creates the necessary initiators, storage views and IVR Zones (both local and cross-connect zoning) for a single host. BUT performing a shared storage provisioning task to an ESXi Cluster fails in a single catalog order, it will also fail if two exclusive storage provision orders are executed at the same time. In summary the workaround is to execute an exclusive storage provisioning order for each host in the cluster individually one at a time. Once this is complete and each host has a volume presented and VPLEX has the correct initiators and storage views created by ViPR, you may then create a new distributed LUN for the whole ESXi cluster. ViPR simply adds the new distributed volumes to existing storage views in VPLEX (there is no zoning going on when you run the ddev creation, thus no locking). Once you have a working distributed volume for all of the hosts, you may then remove the exclusive volumes and everything should function accordingly. Ensure to verify that all the required zoning (including IVR Zones) is configured correctly on all switches and the ESXi hosts can see all associated paths. NOTE: ViPR engineering plan to enhance the Zoning workflow with an additional step to obtain/monitor any IVR database locks before proceeding with the IVR zoning operations. This will be targeted for the next ViPR release. I will provide updates to this post in due course. From the above digram you can see that an ISL is in place for Site-to-Site connectivity, in this example configuration the ISL carries VPLEX-FC-WAN-Replication traffic over VSAN30(Fabric-A) and VSAN31(Fabric-B) -(VPEX FC WAN COM). VSAN30 is stretched between Fabric-A switches on both sites and VSAN31 is stretched between both switches on Fabric-B for Site1&2. VSAN30&31 can be used as transit VSANs for this example IVR configuration. Fabric-A, VSAN10: associated interfaces|PC (even ESX hba of site1, VPLEX FE&BE and PC30) added as members to vsan10. Fabric-B, VSAN11: associated interfaces|PC (odd ESX hba of site1, VPLEX FE&BE and PC30) added as members to vsan11. Fabric-A, VSAN20: associated interfaces|PC (even ESX hba of site2, VPLEX FE&BE and PC31) added as members to vsan20. Fabric-B, VSAN21: – associated interfaces|PC (odd ESX hba of site2, VPLEX FE&BE and PC31) added as members to vsan21. Fabric-A: VSAN30 used as a transit vsan over Port-channel 30. Fabric-B: VSAN31 used as a transit vsan over Port-channel 31. 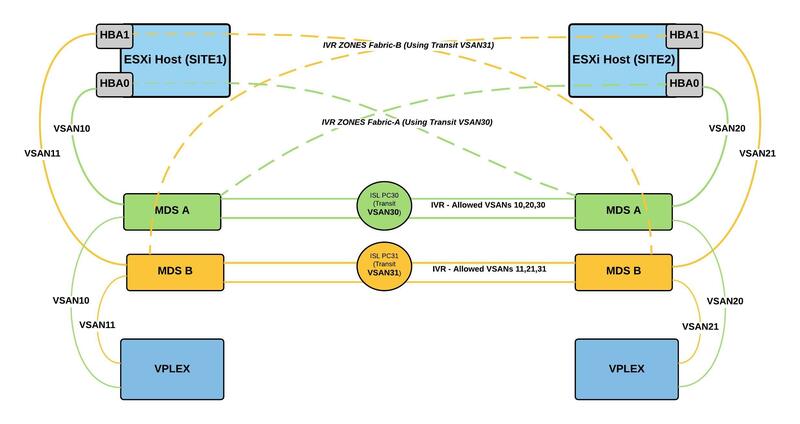 A prereq is required in order for ViPR to successfully create the cross-connect zoning automatically as part of the provisioning workflow, the prereq is to manually create an IVR zone on fabric A, connecting vsan 10 and vsan 20 and an IVR zone on Fabric B connecting vsan11 and vsan 21 (example IVR Zones provided below). Once the VSAN is stretched across the sites as per the prereq for ViPR v2.2, ViPR will then automatically create the required IVR zones as part of the provisioning workflow. Note: The vArray should be set for Automatic Zoning for all this to occur. Verifies unique domain ID assignment. If a domain overlap exists, edit and verify the allowed-domains list or manually configure static, non-overlapping domains for each participating switch and VSAN. Verifies if the ports are operational, VSAN membership, and other configuration settings covered previously. Verifies the name server registration for all devices participating in the IVR. Displays zones in the active zone set. This should include configured IVR zones. Displays the IVR persistent fcdomain database. Shows the IVR internal troubleshooting information. Shows the IVR pending configuration. Shows the difference between the IVR pending and configured databases. shows information that is used by your customer support representative to troubleshoot IVR issues. Shows IVR virtual domains for all local VSANs. Shows IVR virtual fcdomain status. Verifies the configured IVR topology. Verifies the IVR zone set configuration. Verifies the IVR zone configuration. Clears all configured IVR zone information. Note: Clearing a zone set erases only the configured zone database, not the active zone database. Inter-VSAN Routing (IVR) definition: An IVR zone is a set of end devices that are allowed to communicate across VSANs within their interconnected SAN fabric. An IVR path is a set of switches and Inter-Switch Links (ISLs) through which a frame from an end device in one VSAN can reach another end device in some other VSAN. Multiple paths can exist between two such end devices. A Transit VSAN is a VSAN that exists along an IVR path from the source edge VSAN of that path to the destination edge VSAN of that path, in the example solution diagram above you will see that VSAN 30 and VSAN 31 are transit VSANs. Distributing the IVR Configuration Using CFS: The IVR feature uses the Cisco Fabric Services (CFS) infrastructure to enable efficient configuration management and to provide a single point of configuration for the entire fabric in the VSAN. Thanks to @HeagaSteve,Joni,Hans,@dclauvel & Sarav for providing valuable input.